You can go anywhere with the CZ-21 with 10.5" coil. Even 250 feet underwater. 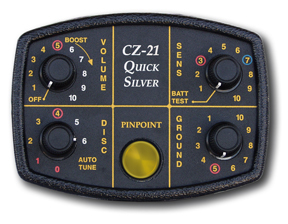 The CZ-21 with 10.5" coil is a go-anywhere, do anything, all-weather, target-ID machine that is leak proof to 250 feet. And its patented electronics make it deep-seeking while it ignores the destabilizing effects of salt water. It is the perfect target ID machine for the versatile treasure hunter who wants to hunt anywhere-underwater, on the beach, in the surf, on dry land and in all kinds of weather.